A fine bottle of wine gets new life in this handsome handmade candle. A fine bottle of wine gets new life in this handsome handmade candle by Kelsey Paz. Colorful found bottles are cut in half, then filled with organic soy and beeswax. The beeswax allows for a slower burn and the natural wood wick emits a crackle when burning to create zero soot. A phthalate and paraben free fragrance offer an aromatic and environmentally kind ambiance. 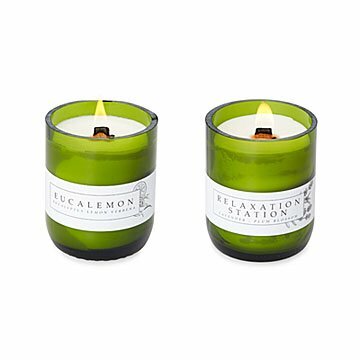 Choose from the soothing scents of lavender with Relaxation Station, or the invigorating fragrance of eucalyptus and lemon with Eucalemon. Handmade in Redondo Beach, California. Growing up in Southern Alabama, Kelsey was submerged in nature. Literally. Her house was nestled deep in the woods, where she was influenced by the trees, creeks, and animals, while being molded by a long line of artists. She carried this Eco & artistic foundation to college and through her internship, eventually landed in a jungle city of another sort, concrete, New York City. Here she cultivated her adaptability skills, learning about rooftop gardens, and frequenting Central Park. It was in New York that she met JD Snyder, an inspired visionary who shared her love for design and the environment. After successfully failing at a few business ventures, they moved to Los Angeles, CA. Kelsey attended and graduated Floral Design School. During that time, when she was opened fully to creativity, is where a spark of an idea led their way to make Eco-friendly candles from recycled wine bottles, Earth's Friendliest Candle. 4" H x 3 dia. ; 10 oz. Never leave a burning candle unattended. Keep away from drafts, pets and children. 21+. Burns approximately 70 hours. Candles hang tag can be planted to grow beautiful wildflowers. These candles are so thoughtfully made from start to finish by a very sweet person. South Bay is my favorite but can never decide and always try their new candles scents. This candle is for my personal quiet reading space that I use to relax and unwind. The candle is beautiful and the smell is awesome. I bought the Eucalemon scent heavenly and fresh. Love the fact it is soy and slow burning. looking for clean fresh scents, and love the recycle bottle look. Got this for a family member's housewarming gift and they loved it! Smells amazing! A gift for people moving into a new home. Looks warm and inviting. I bought this as a gift, but I quickly learned from my friend that it smells great! Better than anticipated. Eucalemon is my new favorite smell! Love the upcycled glass and packaging but the best part really is the long slow burn and the amazing scent.